Solid PDF Tools does what most users need when creating and working with PDF files, including document security, scan to PDF, OCR for search, and PDF/A creation and validation. In addition, Solid PDF Tools leads the industry in PDF to Word conversion excellence. 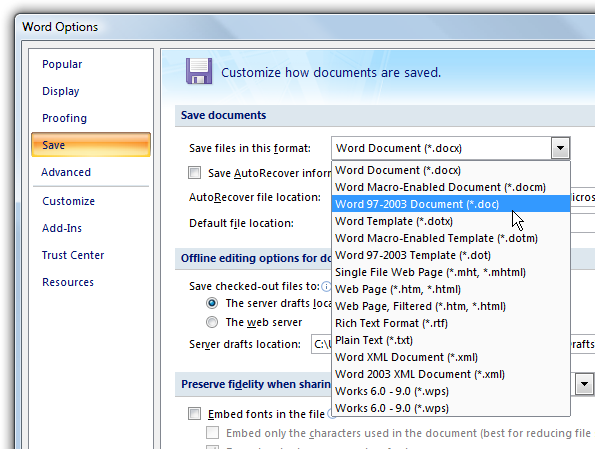 We've just launched a free service for free PDF to Word conversions. To use it go to freepdftoword.org, select your conversion options and click a button to make an e-mail message appear with the settings you've chosen. Attach your PDF file and click send. Our servers will convert the file and e-mail your converted Word Document back to you. One thing that many users notice after upgrading to Microsoft® Office 2007 is that by default new Word documents now end in .docx instead of .doc. Although the new file type offers many improvements over the old one, it can be troublesome to use if you work with many people that have older versions of Office. There are workarounds available from Microsoft, but it's usually easier just to send them something you know they can open. One way to solve the problem is to simply change the default file format in Word 2007 to DOC. To do this go into Word 2007 and click the Office Button | Word Options | Save | Save files in this format | Set this to "Word 97-2003 Document (*.doc)" and click OK.
Now you won't have to worry about whether or not your collaborators can read your files. (or, How I Learned to Stop Worrying and Love the Ribbon). Although this does tend to be more useful than the toolbar in previous versions of Office, it's not always the most efficient way to work. Many users with smaller screens (such as laptops) need as much vertical workspace as possible. The Ribbon can take up far too much of this precious space when all you want to do is enter and correct text. You can still use the Ribbon while it's hidden, just select a tab and the Ribbon will appear again, temporarily.